What's so bad about tampons? Nowadays, tampons and pads are easy, cheap and convenient to buy at any drugstore around, and to most women, that's their only option. 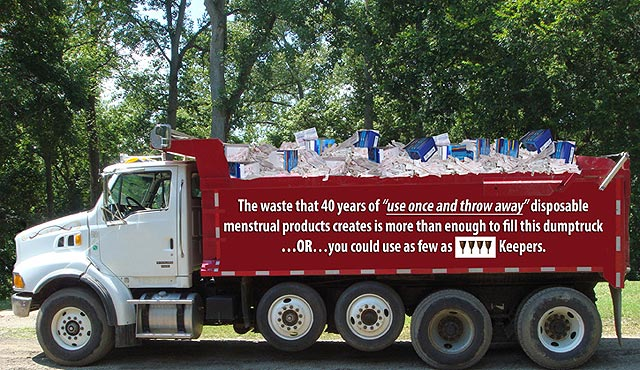 The downside to tampons and pads is that they accumulate a lot of waster OVER TIME! Yeah, one week of tampons, maybe uses one box, that's nothing right? Wrong! Multiply that amount of tampons by 12, the number of months in a year, and then take that number and multiply it by 40, the average number of years a woman is fertile and "cycling" and you end up with one heck of a lot of tampons. Aside from spending a lot of money, look at all that packaging and product that you will be throwing in the trash or flushing down the toilet. 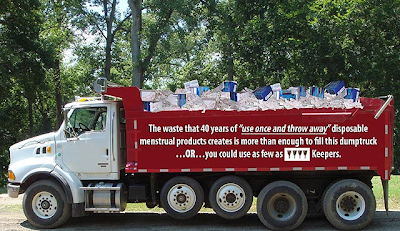 Well, if that wasn't enough to freak you out, check out how much tampon waste the average woman accumulates over 35-40 years of their "menstruating life"...enough to fill this dump truck! 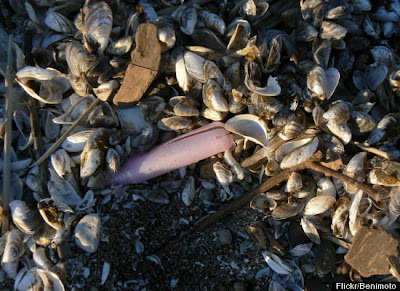 Now although we may think we are properly disposing of our tampons and pads, you can bet that some of them are ending up in our oceans, beaches, and other water sources. Ladies, the fish are really going to love us for this one. As if the amount of waste accumulated wasn't enough, in comes the chemicals. Most tampons get hit with chemicals right out the gate since the cotton used to create the tampons was probably heavily treated with pesticides and fertilizers when it was grown. Then to make the cotton the nice, bright white we are all familiar with it gets treated once again with chlorine, a source of dioxin, a known carcinogen. So as your inserting that comfy little tampon day after day, who knows what your vaginal walls are absorbing over time? Yes, you could go with an organic tampon, like "Organic Cotton No Applicator Tampons" from Seventh Generation, which use organic cotton, are whitened without chemicals containing bleach, and is free of dyes or fragrances. But you would still be stuck buying, throwing out, buying, throwing out, buying, throwing out...month after month. On top of that have you ever tried inserting a tampon with no applicator? That's a fun time right there! Not! 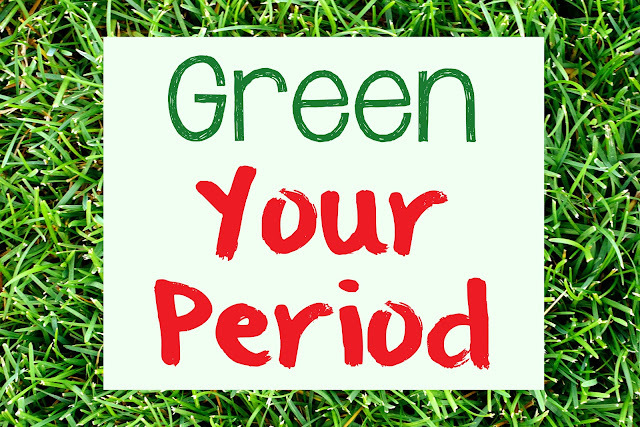 So if tampons are wasteful and full of chemicals, what's a green girl to do? Well the answer isn't pads, which I haven't mentioned much, but are just as wasteful with their packaging, plastics, and other contents. In fact, pads contain polyethylene plastic, which causes pollution when produced. It's time to shift our perspective to a greener source...something that is reusable. Enter The DivaCup. While I was pregnant with Avery I heard about something called a DivaCup, which you insert similar to a tampon, empty after several hours, wash out, and then reuse again. At first it sounded a little gross, but talk about being green. No more tampons? Seriously? So once my period came back when Avery was 9 months old, I got my chance to try out the DivaCup. The upfront price seemed a bit steep, $34 at my local health food store, (only $22 on Amazon), but I saw it as an investment since I knew I could use it for several years. Granted the DivaCup company says it should only be used for one year, I've read other green bloggers say they've used them for up to five years. No matter what, I knew it was time for a change...a green change, so I splurged and bought it. After bringing the DivaCup home, I was a bit intimidated by it at first. It was kind of like learning how to put a tampon in for the first time. Because the big round opening that collects all the flow, well that's the part you put in FIRST! It took some practice and learning how to squeeze the cup to insert it (being sure not to let it pop open midway in...ouch! ), but once it was in I couldn't feel a thing. I pretty much forgot about it. When you insert it, you want to give it a little twist if possible, this will help create a suction to ensure that it will not leak. When it came time to take it out several hours later (you can wear it for up to 12 hours) I used some toilet paper to help me get a good grip on the tip (which I trimmed down a centimeter or two so it wouldn't be hanging out too much), and then I gave it a little cup and out it came. I was then left this small silicone cup full of period blood. It was actually kind of cool to see the coloring and the quantity it had for that given day. I then dumped the cup contents out in the toilet, washed it with water in the sink, dried it, and inserted it again. get a good grip of the tip and with a little tug, it comes out. This pattern continues now every day of my period each month and I love it. When it's not in use, I store my DivaCup in this cute little drawstring bag. No trash, no mess, no fuss. A bit more expensive to start with, but over time it can actually save you a lot of money! The learning curve to get it inserted correctly. Just like learning to insert a tampon, it takes practice to develop your own special technique for insertion...stick with it, you'll get it down in now time. There are two sizes of the DivaCup: Size #1 is for women who haven't had any children, and Size #2 is for women who have had children. You'll want to make sure and get the size that applies to you so it doesn't end up being too big or too small. There is a wash that you can buy for the DivaCup, but I haven't broke down and bought it yet, as it costs around $10 at my local health food store. I'm sure I should probably be washing with this, but in the mean time I just use a diluted mild soap and it seems to be doing the trick. There are other types of reusable menstrual cups on the market like: The Keeper (which I shared the pictures of the tampon waste above), Mooncup, and Lunette, so shop around and find the one that works for you. Sometimes when I'm feeling lazy and don't want to insert the DivaCup again, I'll use some cloth pads during the night when I'm sleeping to collect my flow. I've never been one to love pads, but after purchasing these pads to help with the postpartum flow I had after giving birth to Avery, I got more comfortable with them. I use a the cloth pads shown below that I purchased online from a site called "Mommy and Me Creations" and the pads are called, "Heavenly Cloth Menstural Pads" which are actually made from organic hemp fleece. You can see more and read more about these pads in my post about "Preparing for a Homebirth". The cloth pads I occasionally use at night during my period. There are all kinds of other cool cloth pads out there like: Lunapads, GladRags, and tons of other brands you could find with a simple Google search. 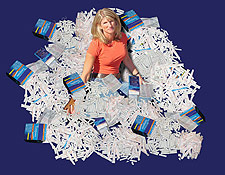 They come in all kinds of colors and styles so you can find ones that you like and that help you go green. I don't know about you, but I've come a long way in understanding and appreciating my period. Back when I first started my period at age 13, I hated it. I actually did a countdown as to how many more periods I'd have before I hit menopause. Yes, it was a large number, but it helped to know an end would be in sight...someday. That's crazy I know, but when you go from your normal "tween" life to having blood come from you know where well, it's not exactly enjoyable. After I got over the fact that my periods were not going away, I took on the typical mindset pushed onto women by society that periods, or "that time of the month" was a time to be dreaded, medicated, and supplied with an array of products to use day and night. Month after month, it was the same drill: by the tampons, pop the Midol, and countdown the days until the bleeding stopped...which for me was always one full week! Usually it was very light at the end, but still 7 full days, no matter what. Thank you period! Well as the years went on and I began learning more about leading a natural lifestyle, I read two books that really changed my view of periods and gave me an "Aha!" as to how amazing my body and periods really are. 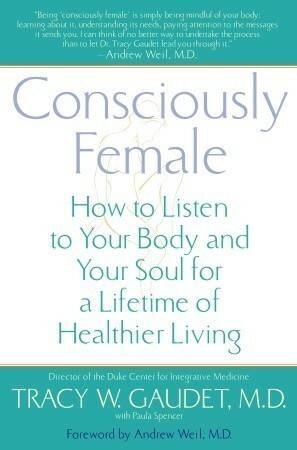 The first book I read was Consciously Female: How to Listen to Your Body and Your Soul For a Lifetime of Healthier Living by Tracy Gaudet, which taught me that each portion of your monthly cycle comes with changes in your body, mind, and emotions. I like how the book put periods in such a positive light and I found myself relating to the various times of the cycle (menstrual phase, follicular phase, ovulatory phase, and luteal phase) and finding the good in each one. For example in the "Follicular Phase" the week after your period, you are "ripe with ideas, creative, energetic, and upbeat." On the other hand, during "Luteal Phase" that week or so before your period starts, you are more likely to retreat inwards, you'll feel more vulnerable, more contemplative, and your unconscious feelings that you've covered up for the rest of the month begin to come out. I saw this as my excuse to go "filter-free" and share how I really felt about things in my life and make changes accordingly. The second book I found was Taking Charge of Your Fertility: The Definitive Guide to Natural Birth Control, Pregnancy Achievement, and Reproductive Health by Toni Weschler. I came upon this book several months before Brandon and I were going to start trying to get pregnant with Avery and it really appealed to the "inner-scientist" in me. It taught me how to chart my cycle, look for predictable signs of fertility (cervical fluid, waking temperature, and cervix placement), and to use that to my advantage to either become pregnant or prevent pregnancy. So instead of seeing my period as something to be dreaded, I saw it as something to look forward to because it meant my body was healthy, "in working order", and in good shape to make a baby. "In my hand are life sized replicas of a non-menstruating uterus and a menstruating uterus. Can you get over the difference in size???!!! This is why we feel so heavy at the beginning of our bleed.... Why it can feel like our uterus is about to drop out and hit the pavement (or is that just me?). And why we need to take things slooooooow." Pretty fascinating right? Women, I think it's safe to say that our bodies are pretty amazing and the more that we learn about them, the more we can appreciate them. In turn, I believe they pay us back with good health, happy periods, and of course the occasional baby (Love you Avery!). Thank you for such an inspiring read. I think I am ready to try a diva cup or similar device. I will be sharing your blog with lots of friends. Great post! I've been using a menstrual cup (Mooncup) since I was 14, which is pretty early compared to most cup users. It's fantastic and is far superior compared to tampons.